Nonstick skillet. Can opener. Rubber spatula and wooden spoons. Blue plates with matching blue bowls. Paper towels. Oreo mint cookies. Cans of diet soda. And the shiny, black 6-cup Braun coffeemaker that sat handsomely on the counter next to my hand-me-down rice cooker. It was my loot from my very first trip to Target many years ago. A few days after I moved in to graduate student housing in Stanford, my friend, Glenn, generously offered me a ride in his red two-door Toyota Celica to the local Target store to get me supplies and to help me get settled in. I was a carless, penniless student at the time who relied heavily on friends to take me around. Before coming to America, I had visions of taking the subway to get to everywhere I needed to go. Little did I know that living in California — living in suburban California — would be so different. I looked at my receipt and felt a sting of sticker shock. But they were all things I needed, I remember telling myself. I guess, that would be true if I left out those Oreos. I was in shock with how much everything had cost. I remember converting every dollar and every cent to pesos in my head as I walked down the aisles of the store. But I also remember getting a kick out of the fact that I could return anything and even everything if I chose to. If you don’t like the coffeemaker, send it back, Glenn told me. Returns and exchanges were absolutely unheard of back home and, for some reason, being able to get my money back, if I needed or wanted to, felt very consoling. I wasn’t only excited about the prospects of unlimited returns and exchanges but I was excited, too, about my new Braun coffeemaker. It wasn’t a fancy French press or a Chemex. It was one of the older models; its price had been slashed if I remember correctly. But it was my very first coffeemaker. My very own. I had visions of brewing my own coffee every morning and taking it with me in a carafe to enjoy on my way to work. I was so excited and couldn’t wait to brew my first cup. Brewing coffee was something new to me back then. I grew up with instant coffee at home and those three-in-ones — coffee, sugar, and cream — packaged in tiny sachets. My dad liked his black while my mom liked hers sweetened with sugar. Nescafé in tall, slender jars with plastic lids was their coffee of choice and they would indulge in freshly brewed coffee only once in a blue moon. I reached inside my pantry for the coffee filters and the Barako [Bah-rah-koh] coffee my sister gave me before I left for California. Bags of ground coffee beans grown and roasted in Cavite, where she lives, was her padala — her parting gift for me. Barako is a rare coffee variety grown in the Philippines, particularly in the provinces of Batangas and Cavite, south of Manila. The beans are indigenous to the Philippines, although Barako trees also thrive in Vietnam and Indonesia. The aroma is pungent and the taste is distinctly dark and rich. Barako, in Filipino, also means wild boar, male stud of an animal or a tough and fearless man. I have often wondered if the exotic Filipino coffee was actually named after the tough barako who drinks his morning coffee strong, without any hint of sweetness. My mouth watered as the coffee gurgled furiously in the pot. I waited impatiently. Restlessly. As soon as the coffee was ready, I poured myself a cup and savored every sip. I enjoyed it immensely while I watched the squirrels frolic in the front yard. It was the perfect cup of brewed Barako. Black and bold. The way I like it. The way a real barako likes it. Where can I find Barako coffee? Barako coffee is difficult to find in North America. I get my Barako fix only whenever I fly home, which I don’t get to do as often as I hope, or whenever someone visits and brings me coffee as pasalubong — a homecoming gift. The town of Amadeo in Cavite has a cooperative that actively engages in trading coffee beans as well as roasting beans and processing ground coffee. Here is a link to the Cafe Amadeo Development Cooperative for more information about Barako coffee. 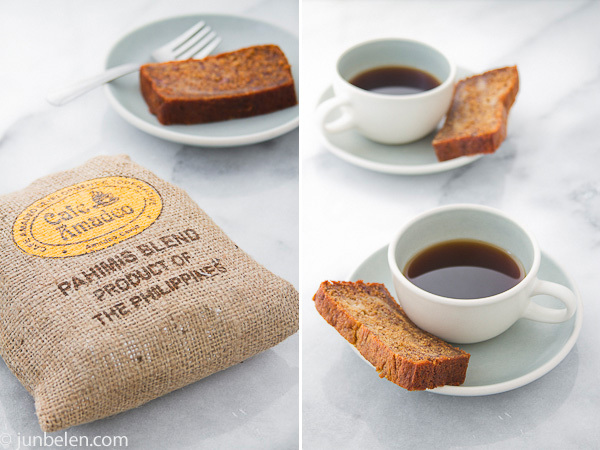 What goes well with Barako coffee? Glazed doughnuts, of course. Bibingka and biko. Okay, Oreos, too. And Pichet Ong’s banana cake. I swear, his could very well be the best banana cake ever. 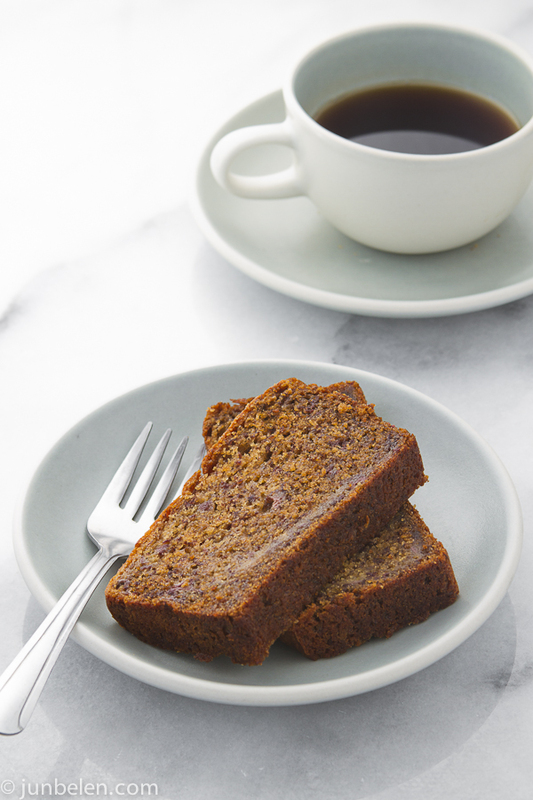 It isn’t too sweet and it is delightfully moist and light. 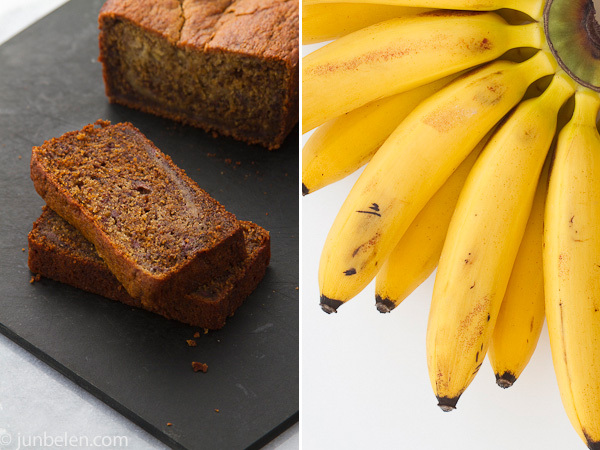 Use ripe baby bananas called Señoritas for their distinct sweetness and texture. And remember not to overmix the batter to keep the banana cake light in texture. Preheat the oven to 350 degrees F. Lightly butter an 8-1/2 x 4-1/2-inch loaf pan and set aside. Sift together the flour, baking powder, and baking soda and set aside. Put the butter, honey, sugar, cinnamon, and salt in the bowl of an electric mixer fitted with the paddle attachment. Beat the mixture on medium-high speed until light and fluffy, about 5 minutes. Scrape down the sides and bottom of the bowl, add the bananas and vanilla, and beat on medium speed until the mixture looks “broken,” or lumpy, about 1 minute. The bananas should be smashed, with a few chunks remaining. Turn the speed to medium-low and beat in the egg until incorporated. Turn the speed to low and gradually add the shifted flour mixture, mixing just until no traces of flour remain, about 10 seconds. Add the yogurt and mix until the batter has only a few remaining white streaks, about 5 seconds. Be sure to avoid overmixing. Gently fold in the chocolate chips, if desired. Transfer the batter to the greased pan. Bake in the center of the oven until a tester inserted in the center comes out clean, about 45 minutes. Cool the cake in the pan on a rack for 5 minutes, then unmold and cool completely on the rack. 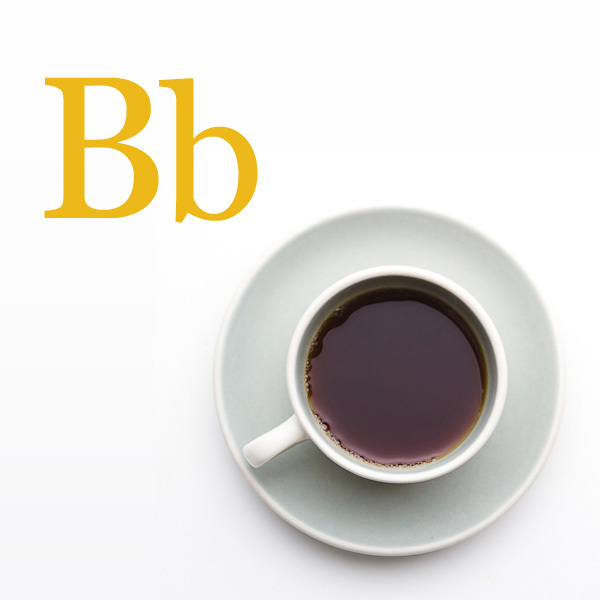 B is for Barako Coffee is the second in a series of posts about Filipino food words. 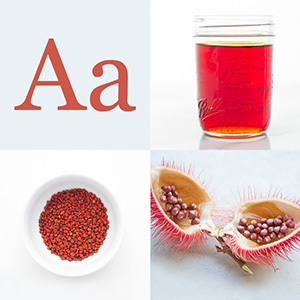 Learn the alphabet through Filipino food through our series and through our glossary. So much is lost in translation, I know, but I hope this glossary will help those unfamiliar with Filipino food become more informed. Oops! Wrong recipe. My comment is for http://blog.junbelen.com/2010/03/24/how-to-make-pan-de-sal-filipino-bread-rolls-at-home/. Sorry! never try yet, but i’m sure it’s yummy.. i will bake now. thank you.